I wrote ten days ago about finishing Lee Child’s latest thriller, 61 Hours (which has entered the NYT bestseller list at #1). What to read next? Since I was back in mystery-thriller mode, it seemed natural to give Robert Crais’ The First Rule another try. Crais has been writing a series of crime novels since 1987, set in LA and centered on private detective Elvis Cole, with a featured role for his partner Joe Pike. The eleventh of the series, The Watchman, appeared in 2007, with Joe Pike as the central character. I didn’t discover Crais until Chasing Darkness, which was published a year later and had Cole back as the lead character. When The First Rule appeared earlier this year, I snapped it up. I had by then forgotten about Cole and Pike. The fact that this was another Joe Pike novel didn’t make an impression on me, since I didn’t remember that the previous one was an Elvis Cole novel. I explained in mid-February that “I had forgotten that if one is going to read crime novels, one has to have the stomach for gruesome crimes. I started it right away, but a few pages in . . . , these guys busted into a house and I decided to put the book aside for now, just short of the gruesomeness.” Last week, I pushed past the gruesome point, only to discover that Crais ends the scene before it gets too awful, and nothing anywhere near as gruesome occurs after that. I shouldn’t have put the book down the first time. I quickly came to appreciate Pike, strong and silent much like Lee Child’s Jack Reacher. And I appreciated Crais’ excellent prose as well. It’s a good book. Suspense, plot twists, the usual, but also excellent characters. I was sorely tempted to go back to the previous Joe Pike novel. The Kindle makes it so easy to act on such temptations. I could have downloaded The Watchman and been reading it within a minute. But I do have other things to do with my time, and didn’t want to be absorbed in yet another thriller so soon, so I resisted. Already on my Kindle are the first two Stieg Larsson novels, The Girl with the Dragon Tattoo and The Girl Who Played with Fire. Gail read them in the fall, when we were in Europe. Since we share our Kindle account, that means I have access to them too. I wasn’t overly inclined to read them, other than to find out what the fuss has been about. And now the third one is upon us: The Girl Who Kicked the Hornet’s Nest. Gail had pre-ordered it, so that it automatically downloaded to her Kindle last week, on its first day of availability. Should I read them? I was considering it, but again, I wanted to get away from thrillers for a bit. Two days ago, I saw my friend Carolyn for the first time in many months. As always, her first question was, what am I reading? I reviewed the above. I also mentioned the possibility of returning at long last to the novel I just had to read back in the fall, Hilary Mantel’s Wolf Hall, about which I wrote incessantly in assorted blog posts. Carolyn, it turns out, loves Larsson and is reading his latest now. She also is a fan of Wolf Hall. Her advice — read Larsson, then Mantel. 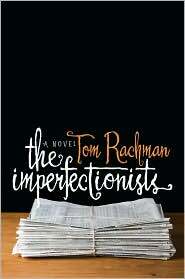 She then mentioned yet another book, Tom Rachman‘s new novel The Imperfectionists. Molly had sent her a link to Christopher Buckley’s review of it in the Sunday NYT last month. I didn’t remember the review. Yesterday, Carolyn emailed the review’s link to me. I saw right away why I had missed the review — it came out the Sunday that we were in Gettysburg and I missed the paper that day. It was, in fact, the cover book review. Set in Rome, The Imperfectionists is a novel told in linked stories about the private lives of the reporters, editors and executives at an international English-language newspaper as they struggle to keep their publication—and themselves—afloat. Kathleen, the tough editor-in-chief, experiments with betrayal in her open marriage. Arthur, the lazy obituary writer, is transformed by a tragedy at home. And Abbey, the besieged financial officer, finds that that her job cuts and her love life are intertwined in unexpected ways. Out in the field, the veteran Paris reporter goes to desperate lengths for his next byline, while an inexperienced new Mideast stringer is seeking terrorists to interview. In the shadows is the isolated young publisher whose actions may determine the future of every employee at the paper. The Imperfectionists touches on the decline of newspapers and the rise of technology, but above all it is about these characters and their peculiar stories. I still have a ways to go, but based on what I’ve read so far, I recommend it highly. I wish I were in Rome now eating with some of the characters.